I thought I would start a discussion on a specific maker in hopes that it might generate a more, in-depth look, at shields and perhaps generate some higher interest for the shield collectors out there. 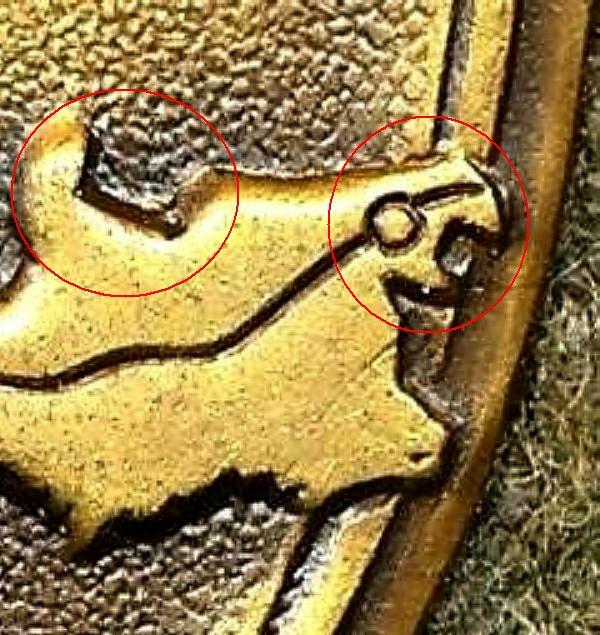 Many collectors are always asking if something is real or not and I hope this type of thread helps those that are not used to looking for the small details that often associate or differentiate the different makers and genuine from fake shields on the market. Please, do not turn this into another one of those, is this real or how much is it worth(?) type threads. In this case, I would like to discuss the Deumer Krim, as I have yet to add any to my personal collection and wanted to get some thoughts on this particular maker prior to purchasing one down the road. 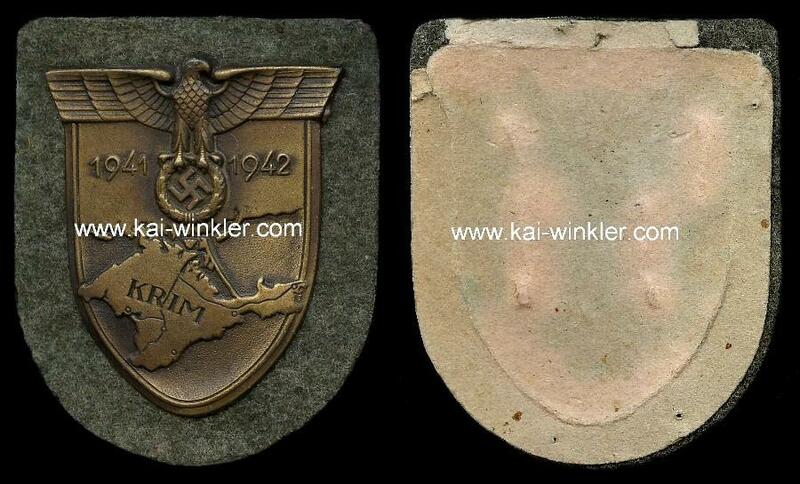 I will be using different photos obtained from various sources (dealer sites/private collection pieces) so, if I use one of your shields, take no offense as I use these particular shots as an aid in identifying original examples. I have photoshop'd the PICs so each has the same color background to make them more or less the same to the eye. I wanted to remove all dealer watermarks but, it would have removed details as well, so I left them. I might refer to Sascha Weber's book for referenced page numbers and this is referencing his 1st edition dated 2005. I do not have his more recent revision. 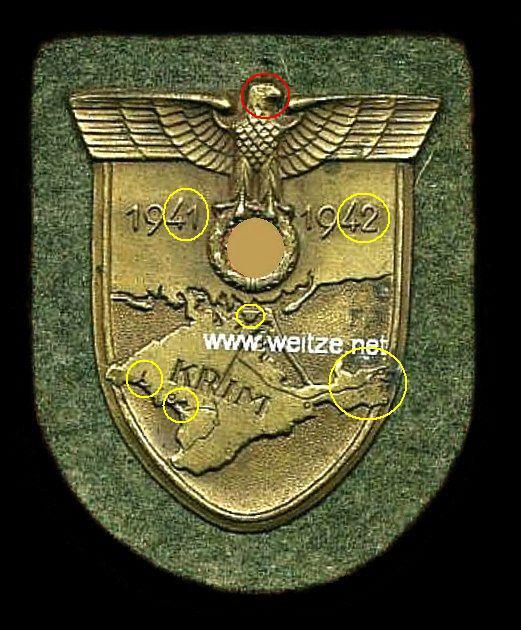 The first shot shows a typical Krim shield with certain areas highlighted. This style Krim is shown in Weber's book on page 26, though this example does not have the round wire pins as shown in the book. Instead, it has the typical flat-style often seen on these shields. 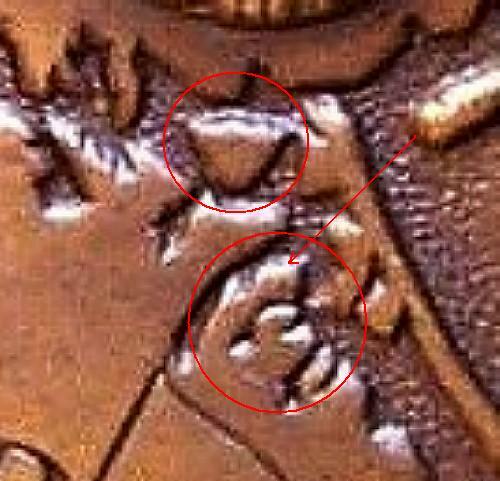 Note the head is circled in red. We will come back to the head differences towards the end but, right now, I want to point out the yellow circled areas and will be showing close-ups of those in posts to follow. There are other areas to compare, but I thought these areas were the easist to point out for now. What I want the others to observe is that in each follow-on example, the areas circled in yellow remain virtually the same, except where wear might show some minor trait differences. Let's start with the numerals. Note the "1" is considerably shorter and the "2" has a shorter horizontal tail and kind of a bullbous nose. Note also, how the numerals "4" have very short vertical legs. 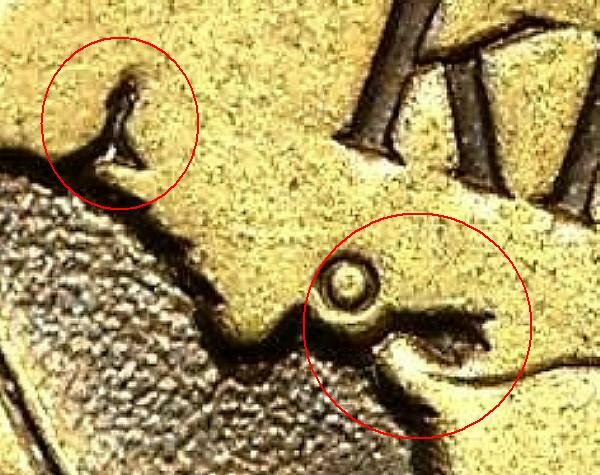 The center area of all Krim shields have the same general land mass and coastline details, but on the Deumer shields, that little center "island" is always this fairly squarish or upside down pyramid shape. Note also the long, what I often think of as the "anteater's nose" and note how the contours of the upper edge and ends look like. The next area I want to show is towards the left side of the shield. Note the particular shapes of the two areas called out. The lower point almost looks like a bird's web-foot. And, now to the right side of the shield. Note the square (almost like an open-end socket) shape and the far right details. Sort of reminds me of one of those Pacific Northwest totem pole animals. Okay, enough details, now some shields and getting towards some items to consider. 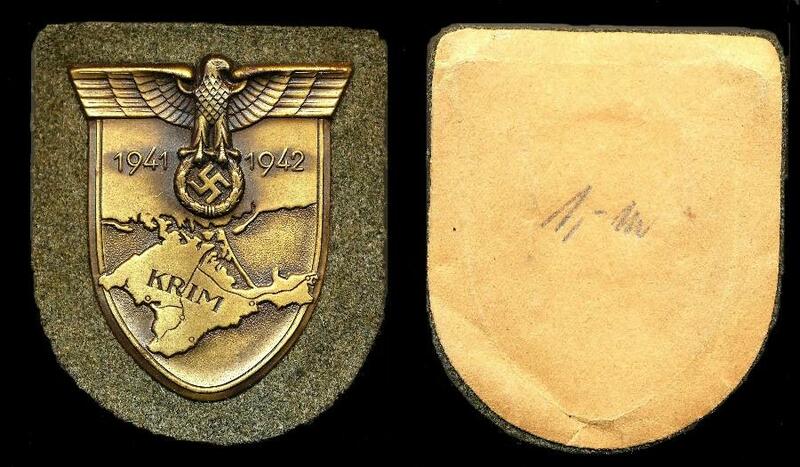 Here's the first, a rather nice conditioned shield and one that was used for the majority of the detailed shots. Another, same type example with more rough finish. And yet another, in near mint condition despite the corrosion on the eagle's head and right side unfortunately. No backing on this one but, the details are still identical to the previous ones. Now, in this PIC, we see something slightly different. 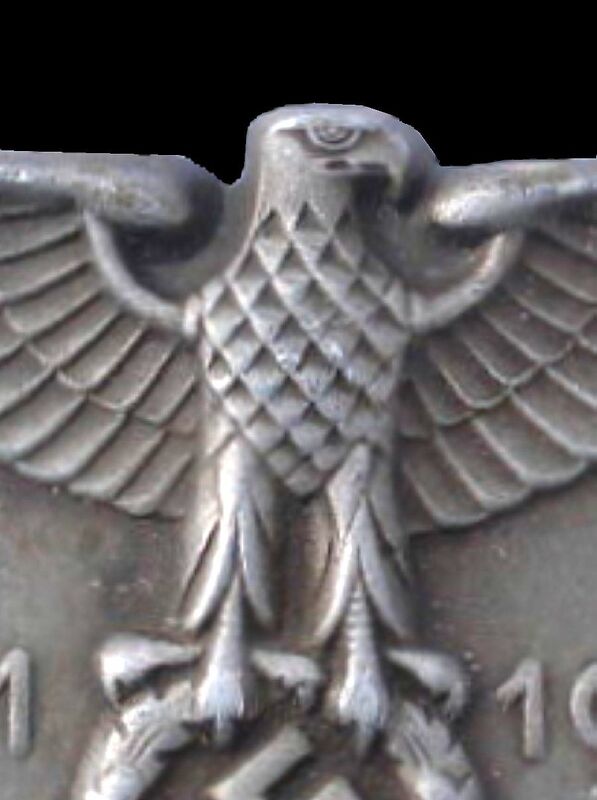 Note the eagle's head and how it appears less detailed or worn across the top. If you compare the top edges with the previous examples, you'll note this one has more slope to it. This is not the only example and is also shown in Weber's book on page 28. I might think this happened when the die got worn and maybe cleaned or widened a bit. Note, all the other details have remained the same though! Then, there is this type. Now, I have seen more than a few with these details so I know it's not just lighting or a case of one or two that exist, but note the head details are very crisp and striking. The beak is well defined and the top of the head is flat. The definition between the eyes, mouth, and beak is very clear on this style. Last, here is a comparison of the three different style heads and...if you might follow me for a moment...what may be a timeline of die progressions of the Deumer shield. Again, dies don't get better with age and the details generally get poorer as time and use wears on them. Keep in mind that on all the shown examples above, the other details have remained consistent throughout. Okay, now for the questions and hopefully some discussion. 1) On the example shown on Page 26 in Weber's book with the round wire pins; where would that fall into as far as production time. My understanding is that the round wire examples were thought to be the earlest versions? If that were true, then it would not support the timeline I think and discuss above as those shields with the flatter head and more distinct features all have the flat style pins. 2) Weber alludes to the shields in his book as two different style Krim shields; (pg 26 & pg 28). 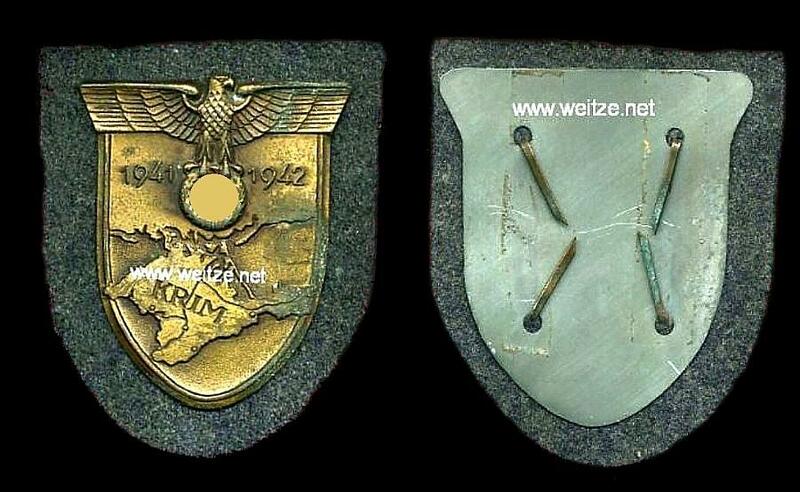 But, if the shields are two completely different shields, how would the details (other than the eagle's head) be exactly the same? IMO, the die is the same, just a wear difference. 3) What style, if any, were made only in zinc? 4) How many shields with the round pins do we actually know about and are they all the same version as shown in Weber's page 26 example? I'm ready to hear other opinions. Ah, another late addition and in zinc. Note the head. And, a better close-up of the head. You can see the actual head line on this one. So, now what to think? If this style is in zinc, what about the other styles and which came first? Great idea this especially for guys like me. I will try to add my twopence worth but dont know if I am going to be much use to you. What you say about die wear makes a lot of sense to me and could indeed account for some minor detail changes. However, I note in my edition of Webers book he lists three Krims and all three are different sizes. I am not going to go on weights as materials vary and of course these things have backing plates etc etc but I doubt if die wear would account for size variations. Webers first Deumer in my book 1.01 he lists as made from zinc with the round pins...width 62.05mm x 43.90mm. 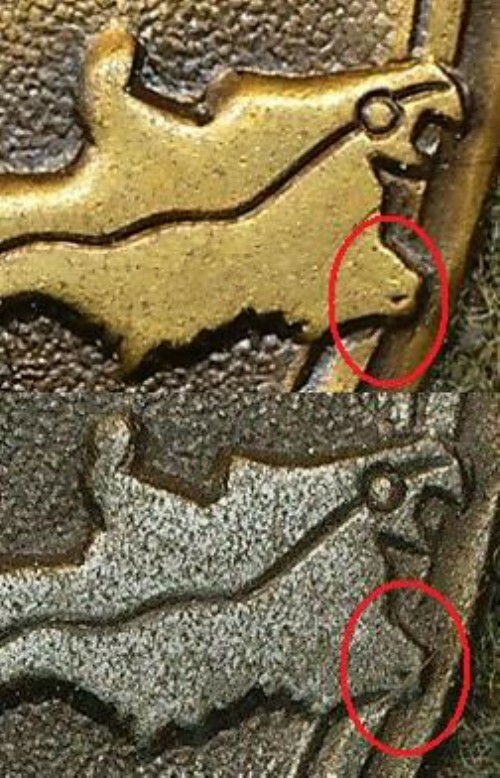 The second, that being 1.02 he says is the same but made from bronzed metal (bear in mind my edition is in German). My argument here is if this shield was from the same die and it certainly looks like it then how come it is width 64.00mm x 43.90mm. Same height but nearly 2mm wider is a bit of a difference. Then the third numbered 1.03 also made from zinc but with flat pins and very much looks like the shield you posted on #6 is width 60.05mm x 44.20mm. Thus the difference between the three is as much as 4mm in width (Shield 1.01 as opposed to shield 1.03) Thats a lot. With that in mind I can only assume that Deumer did in fact use different dies or am I completely off the rails with this. Mate I will most certainly continue with this but for now its bed time. So will continue this tomorrow. In the meantime here is a pic of the one I have on order. By the way I tried you suggestion re the scanner with dark cloth but no joy...will have to try a camera. Talk later and I am sure others will join in. Yes, having different references will be one of the issues when discussing these shields, but I think we can still get some good information out of it. Weber only lists two shields as Deumer in the first book and I show examples of those. I expect he used the same two and added a third to his second revision. Interesting shield you have there and I can't make out the head in great detail, but it appears different from the three I showed above. Can you confirm? Again, all the other details are correct and consistent. So, good start my friend! 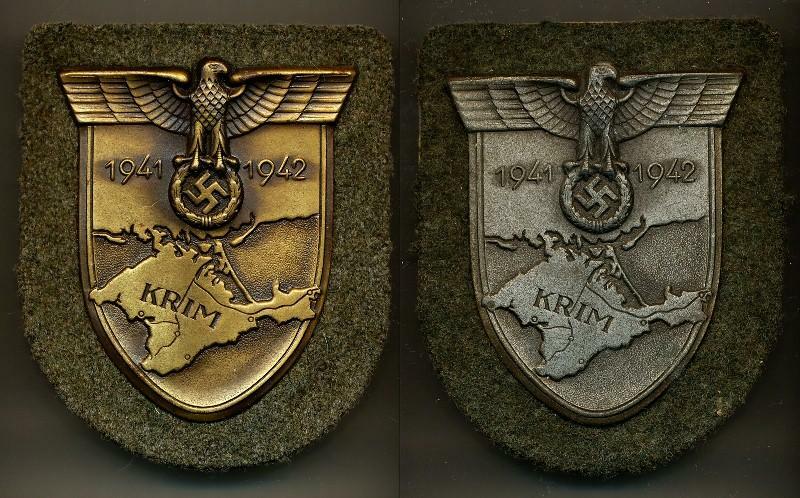 Peter sent me these two PICs today and you can see the one on the left (same shield shown earlier in post #6) is identical to the zinc version on the right. So, perhaps this is more actual evidence of multiple type differences. 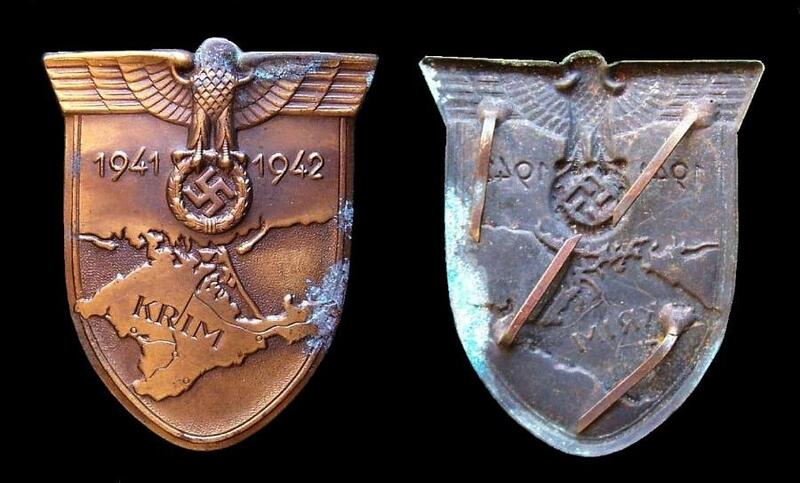 Pete, can you confirm the shield on the left is stamped bronze sheet or zinc? Thanks for the PICs buddy! My shield arrived today and I havent yet had much chance to look closely at it but it is magnetic with a lot of patina. 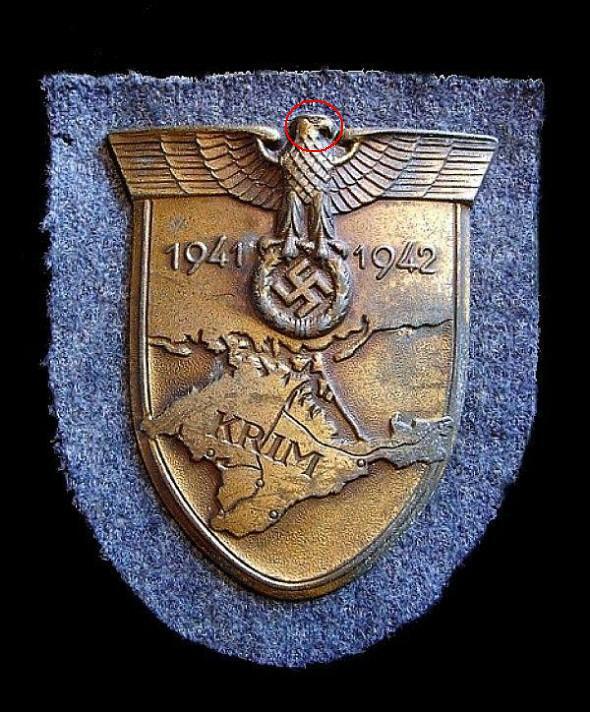 The Eagles head is identical with the shield shown on pic #6. Cant give you exact sizes as I dont have anything to measure that accuratly. One thing that puzzles me and maybe you can shed some light on this........How do we know these shields shown are made by Deumer..... 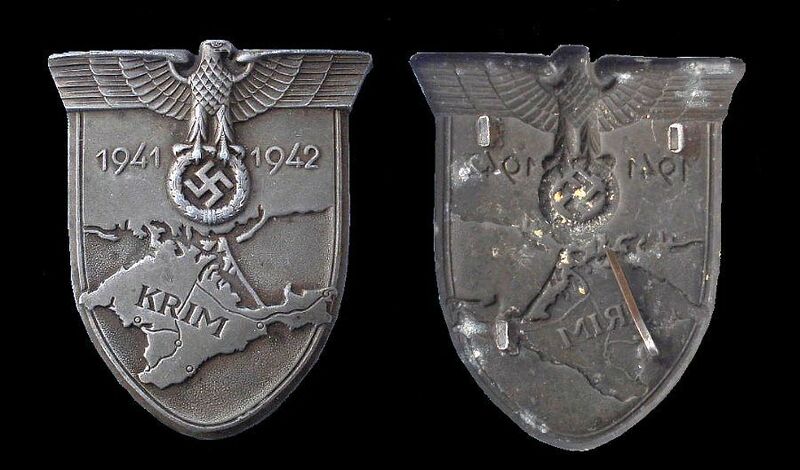 I can appreciate the Orth shields as some have a maker mark on the back the same as the Wurster shields but I have yet to see anybody shown me a Deumer MM on any of these shields so where did this info come from. Curious thats all. Back soon. First, the thing about taking measurements (size and weight); is everyone has to have the same criteria when doing this. This means they have to have a reliable and calibrated measuring scale, know how to use it and take a couple measurements to get the "average" so the one time it weighs a couple of grams different, you can rule that one out. Of course, as you already alluded to, there are a lot of variables such as material used for the shield, backplate, if it has cloth/paper, missing pins, etc. I really don't put much confindence in weight alone, just use it to see if its in the ballpark. There are cheap reliable scales on the market. I suggest getting one that has the ability to measure in grams. Size dimensions should be very close though but, again, it requires the people doing the actual measuring to be consistent with their measuring instruments and consistent with exactly where you take the measurements. A slightly different placement on the shield could yield a minor difference in measurement, but if we're talking 2-3 MM, it could happen, especially if there is wear and ... someone doesn't use the dial caliper correctly. I have measured badges before and often take 2-3 measurements just to ensure I didn't overtighten the knob, or let something shift. And, everyone has to do it the same! I assume the measurements you're referencing are taken out of Weber's book, but did he do all the measurements himself, or get the information from other sources? So, bottom line and in my opinion only, use the die characteristics most of all and the "measurements" to weed out the out-right fakes. As far as the Deumer connection to these shields; you're correct that we haven't seen any actually marked with a manufacturer's logo, but, and Peter can confirm this, several of these "types" have been seen or taken off of Dealer "sales boards" and it was just considered a given that they were from Deumer as other products on the board were marked with Deumer markings. Same can be said of the Deumer style Narviks. Hope that helps answer some questions. To be honest I dont really pay a lot of attention to weights and measurements. I have a very good set of scales (ex police for drug use) but as said some shields have steel back plates others have zinc and of the course the metal used in the shield itself will alter weights a tad here and there. You are correct in that I used the dimensions as listed in Webers book. No idea how he came about them but I would assume if you are going to the trouble of penning a book about a particular shield you would have means to measure and weight them but who knows maybe he was supplied these dimensions by various sources. I agree with you 100% that precis measurement taking is a painstaking proceedure and to be honest Tim I wouldnt be at all concerned over point so and so of a mm or even 1mm difference but when two shields made supposedly by the same manufacturer (and I have no reason to doubt they were) then I can only assume different dies were used. No amount of deterioration on the part of the die would account for such a size variation. IMHO. I have collected badges with obvious signs of die wear and in that I mean softening of the detail and out right fuzziness for want of a better word. In some cases fine detail is completely gone when a die has been overused. The two T Rex Krims that I have are a good example. One has pretty good detail whilst the other is completely missing detail in some areas but both still measure pretty much the same in size. So Tim it is going to take a bit of convincing to win me over on the point of Deumer using the same die for all his Krims but in response to your point concerning the exact same detail on all Duemer's shields apart from the Eagles head being different then I cant help with that one. I have no idea how detail can match precisely on all but a very small portion of the shield and in this case the head. It certainly makes my logic of more than one die fall flat on its face but the size thing is still big with me. I do note however that the large Duemer shield the one that is 64mm wide has an eagle with a fairly flat head whilst the smaller Duemer 60.05mm has a more rounded head. 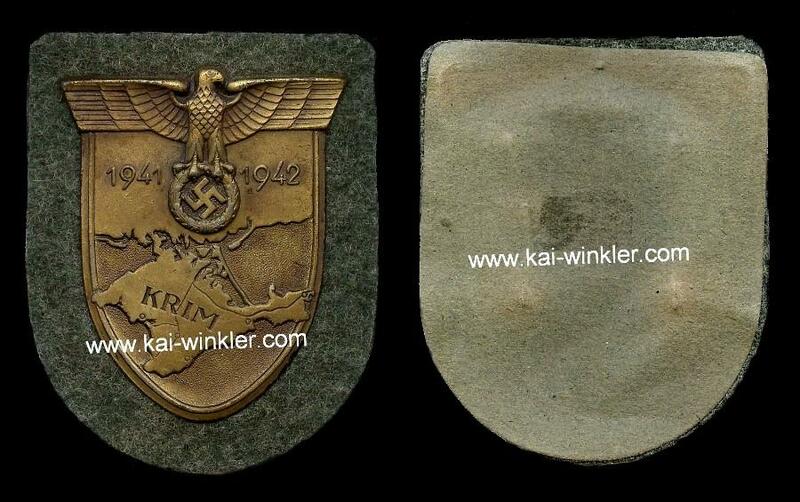 From my experience with combat badges the hard detail of any given badge softens as the die is used and a completely worn out die would be devoid of fine detail altogether. This would account for there being no detail on the eagles head such as lack of eyes but would not account for a complete change to the shape of the eagles head. I guess Tim I am not helping at all just compounding the problem really. Surely there must be others out there who would share their thoughts. I would love to be proven wrong here. Oh yeah. Thanks for that info about where the Deumer ownership came from. I kinda figured that was what it was and fully accepted. Hi Tim...great discussion. The shield on the left is magnetic sheet metal. Now, I've measured both shield's using digital calipers and both shields come out at 61.95mm X 43.90 (on the shield below the wings). 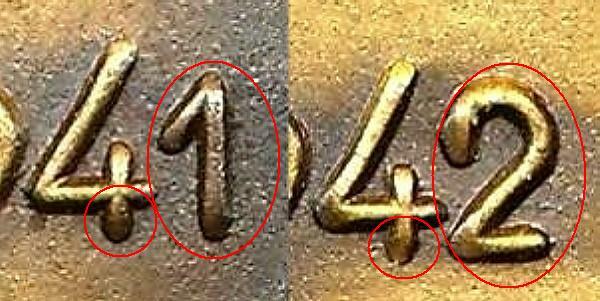 Which can only suggest both shield's were produced from the same Die stamp. Phil, no worries, the whole purpose of having discussions is to see what others think and to learn from other's observations. I do not have any Deumer shields in my possession and cannot make accurate statements one way or the other based just on photographs and other people's descriptions. Now, if the concensus shows that something is what it is...well then you take it as accurate information. Glad you're here! Any chance you might be able to take a shot of the shields side by side showing the difference in size on the two you are talking about or maybe a cut & paste composite that is in correct size on both shields? That's great, I have not had time to really sit down and look at the large format PICS you sent me, but I see it. Is there any other spots/indicators?